Marta Kaźmierczak – dr, rusycystka, anglistka, przekładoznawca, adiunkt w Instytucie Lingwistyki Stosowanej UW. 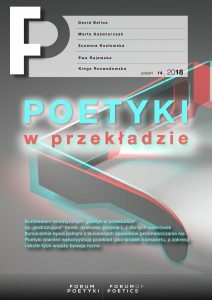 Jej główne zainteresowania badawcze to kulturowe aspekty przekładu, intertekstualność, intersemiotycz-ność, tłumaczenie poezji. Autorka monografii Przekład w kręgu intertekstualności. Na materiale tłumaczeń poezji Bolesława Leśmiana (Warszawa 2012) i ponad trzydziestu rozpraw dotyczących tłumaczenia i recep-cji. Marta Kaźmierczak, PhD, assistant professor at the Institute of Applied Linguistics, University of Warsaw. She holds MA’s in English and Russian and PhD in the Humanities. Her main research interests are cultural as-pects of translation, intertextuality, intersemioticity, poetry translation. She has authored the monograph Przekład w kręgu intertekstualności. Na materiale tłumaczeń poezji Bolesława Leśmiana [Translation in the domain of intertextuality (Warszawa 2012)] as well as over thirty papers devoted to translation and recep-tion. The present contribution is an attempt to explore the interrelation between the notions of quality and seriality in literary translation. Its aim is not, however, judging the “excellence” of the target texts in a normative way, but rather observing certain “quality patterns” in translation poetics.